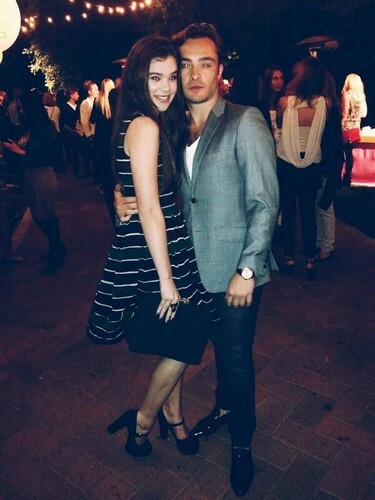 Hailee Steinfeld with Ed. "Hailee Steinfeld @HaileeSteinfeldWith Ed Westwick at last night's City mwaka Los Angeles Fundraiser. Great event for a great cause. I've missed him!". HD Wallpaper and background images in the Ed Westwick club tagged: ed westwick 2013 photo. This Ed Westwick photo contains suti biashara, biashara suti, wamevaa vizuri mtu, suti, suruali nyayo, pantsuit, mtu wamevaa vizuri, and suti ya suruali. There might also be pantleg, hip boot, thigh boot, outerwear, and overclothes.